For other uses, see Hagia Sophia (disambiguation). The Hagia Sophia (Greek: Ἁγία Σοφία, Holy Wisdom) in Thessaloniki, Greece, is one of the oldest churches in that city still standing today. It is one of several monuments in Thessaloniki included as a World Heritage Site on the UNESCO list. 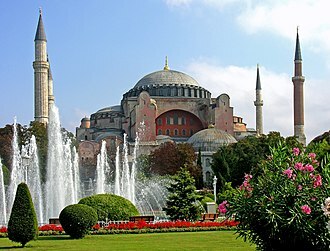 Since the 3rd century, there was a church in the location of the current Hagia Sophia. 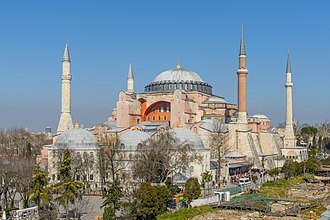 In the 8th century, the present structure was erected, based on the Hagia Sophia in Constantinople (present-day Istanbul, Turkey). In 1205, when the Fourth Crusade captured the city, the Hagia Sophia was converted into the cathedral of Thessaloniki, which it remained after the city was returned to the Byzantine Empire in 1246. 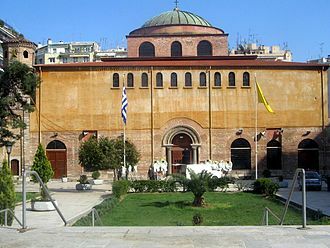 After the capture of Thessaloniki by the Ottoman Sultan Murad II on 29 March 1430, the church was converted into a mosque. It was reconverted to a church upon the liberation of Thessaloniki in 1912. Its ground plan is that of a domed Greek cross basilica. 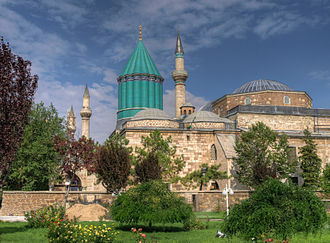 Together with the Gül and the Kalenderhane Mosques in Istanbul and the destroyed Church of the Dormition in Nicaea, it represents one of the main architectural examples of this type, typical of the Byzantine middle period. In the Iconoclastic era, the apse of the church was embellished with plain gold mosaics with only one great cross, similarly to the Hagia Irene in Constantinople and the Church of the Dormition in Nicaea. The cross was substituted with the image of the Theotokos (God-bearer, or Mary) in 787-797 after the victory of the Iconodules. The mosaic in the dome now represents the Ascension with the inscription from Acts 1:11 "Ye men of Galilee, why stand ye gazing up into heaven?". The dome is ringed by the figures of all Twelve Apostles, Mary and two angels. Between 1907 and 1909 byzantine historian Charles Diehl restorated the whole building that underwent many damages during a fire in 1890. Much of the interior decoration was plastered over after the Great Thessaloniki Fire of 1917. The dome was not restored until 1980. Krautheimer, Richard (1986). Architettura paleocristiana e bizantina (in Italian). Einaudi, Turin. Wikimedia Commons has media related to Saint Sophia Church, Thessaloniki. This is a list of Christian cross variants. The Christian cross, with or without a figure of Christ included, is the religious symbol of Christianity. A cross with figure of Christ affixed to it is termed a crucifix, the term Greek cross designates a cross with arms of equal length, as in a plus sign, while the term Latin cross designates a cross with an elongated descending arm. Numerous other variants have developed during the medieval period. Christian crosses are used widely in churches, on top of buildings, on bibles, in heraldry, in personal jewelry, on hilltops. Crosses are a prominent feature of Christian cemeteries, either carved on gravestones or as sculpted stelae, roman Catholic and Lutheran depictions of the cross are often crucifixes, in order to emphasize that it is Jesus that is important, rather than the cross in isolation. Large crucifixes are a prominent feature of some Lutheran churches, as illustrated in the article Rood, several Christian cross variants are available in computer-displayed text. In Christian theology and ecclesiology, the apostles, particularly the Twelve Apostles, were the primary historical disciples of Jesus, the central figure in Christianity. During the life and ministry of Jesus in the 1st century AD, the word disciple is sometimes used interchangeably with apostle, for instance, the Gospel of John makes no distinction between the two terms. In modern usage, prominent missionaries are often called apostles, a practice which stems from the Latin equivalent of apostle, i. e. missio, for example, Saint Patrick was the Apostle of Ireland, and Saint Boniface was the Apostle to the Germans. The commissioning of the Twelve Apostles during the ministry of Jesus is recorded in the Synoptic Gospels, after his resurrection, Jesus sent 11 of them by the Great Commission to spread his teachings to all nations. This event is called the Dispersion of the Apostles. There is an Eastern Christian tradition derived from the Gospel of Luke of there having been as many as 70 apostles during the time of Jesus ministry. Prominent figures in early Christianity, notably Paul, were called apostles. 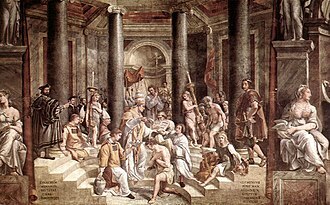 The period of early Christianity during the lifetimes of the apostles is called the Apostolic Age, during the 1st century AD, the apostles established churches throughout the territories of the Roman Empire and, according to tradition, through the Middle East and India. In his writings, the epistles to Christian churches throughout the Levant, Paul did not restrict the term apostle to the Twelve, the restricted usage appears in the Revelation to John. By the 2nd century AD, association with the apostles was esteemed as an evidence of authority, Churches which are believed to have been founded by one of the apostles are known as apostolic sees. Pauls epistles were accepted as scripture, and two of the four gospels were associated with apostles, as were other New Testament works. Various Christian texts, such as the Didache and the Apostolic Constitutions, were attributed to the apostles, bishops traced their lines of succession back to individual apostles, who were said to have dispersed from Jerusalem and established churches across great territories. In architecture, an apse is a semicircular recess covered with a hemispherical vault or semi-dome, known as an Exedra. Smaller apses may be in other locations, especially shrines, an apse is a semicircular recess covered with a hemispherical vault. 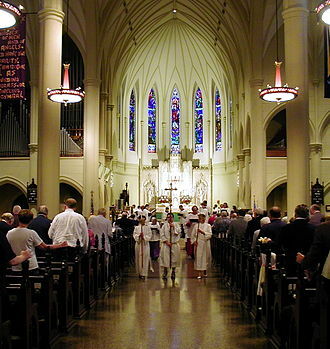 Commonly, the apse of a church, cathedral or basilica is the semicircular or polygonal termination to the choir or sanctuary, in relation to church architecture it is generally the name given to where the altar is placed or where the clergy are seated. An apse is occasionally found in a synagogue, e. g. Maoz Haim Synagogue, the apse is separated from the main part of the church by the transept. Smaller apses are sometimes built in other than the east end. The domed apse became a part of the church plan in the early Christian era. In the Eastern Orthodox tradition, the apse is known as diaconicon. Various ecclesiastical features of which the apse may form part are drawn here, The chancel, directly to the east beyond the choir contains the High Altar. Murad II was the Ottoman Sultan from 1421 to 1444 and 1446 to 1451. Murad IIs reign was marked by the war he fought against the Christian feudal lords of the Balkans and the Turkish beyliks in Anatolia. He was brought up in Amasya, and ascended the throne on the death of his father Mehmed I and his mother was Valide Sultan Emine Hatun, his fathers third consort. 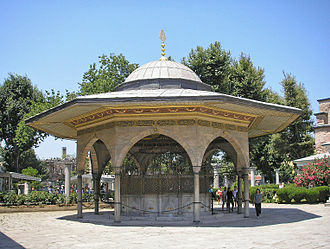 Murad was born in June 1404 to Sultan Mehmed I and his wife Emine Hatun, in 1410, Murad came along with his father to the Ottoman capital, Edirne. After his father ascended to the Ottoman throne, he made Murad governor of the Amasya Sanjak, Murad remained at Amasya until the death of Mehmed I in 1421. Murads reign was troubled by insurrection early on, the Byzantine Emperor, Manuel II, released the pretender Mustafa Çelebi from confinement and acknowledged him as the legitimate heir to the throne of Bayezid I. 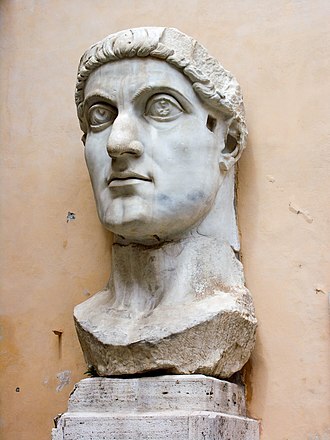 The Byzantine Emperor had first secured a stipulation that Mustafa should, if successful, the pretender was landed by the Byzantine galleys in the European dominion of the sultan and for a time made rapid progress. Many Turkish soldiers joined him, and he defeated and killed the veteran general Beyazid Pasha, Mustafa defeated Murads army and declared himself Sultan of Adrianople. He crossed the Dardanelles to Asia with a large army, Mustafa was out-manoeuvered in the middle of the field, and his troops, whose confidence in his person and cause he had lost by his violence and incapacity, passed over in large numbers to Murad II. Mustafa took refuge in the city of Gallipoli, but the sultan, Murad II formed a new army called Azeb in 1421 and marched through the Byzantine Empire and laid siege to Constantinople. Murad had to abandon the siege of Constantinople in order to deal with his rebellious brother and he caught Prince Mustafa and executed him. The Anatolian states that had been plotting against him — Aydinids, Germiyanids and Teke — were annexed. Murad II declared war against Venice, the Karamanid Emirate, the Karamanids were defeated in 1428 and Venice withdrew in 1432 following the defeat at the second Siege of Thessalonica in 1430. The History of Roman and Byzantine domes traces the architecture of domes throughout the ancient Roman Empire and its medieval continuation, today called the Byzantine Empire. The domes were customarily hemispherical, although octagonal and segmented shapes are known, and they developed in form, use. Early examples rested directly on the walls of round rooms and featured a central oculus for ventilation. Pendentives became common in the Byzantine period, provided support for domes over square spaces, Nero introduced the dome into Roman palace architecture in the 1st century and such rooms served as state banqueting halls, audience rooms, or throne rooms. The Pantheons dome, the largest and most famous example, was built of concrete in the 2nd century, Imperial mausolea, such as the Mausoleum of Diocletian, were domed beginning in the 3rd century. Brick ribs allowed for a structure and facilitated the use of windows in the supporting walls. Christian baptisteries and shrines were domed in the 4th century, such as the Lateran Baptistery, Constantines octagonal palace church in Antioch may have been the precedent for similar buildings for centuries afterward. His Hagia Sophia and Church of the Holy Apostles inspired copies in centuries, domes over windowed drums of cylindrical or polygonal shape were standard after the 9th century. In the empires period, smaller churches were built with smaller domes, exceptions include the 11th century domed-octagons of Hosios Loukas and Nea Moni, and the 12th century Chora Church, among others. Rounded arches and domes distinguish Roman architecture from that of Ancient Greece and were facilitated by the use of concrete and brick. By varying the weight of the material in the concrete. But concrete domes required expensive wooden formwork, called shuttering, to be built and kept in place during the curing process, formwork for brick domes need not be kept in place as long and could be more easily reused. Roman domes were used in baths, villas and they were customarily hemispherical in shape and partially or totally concealed on the exterior. A variety of shapes, including shallow saucer domes, segmental domes. The audience halls of many imperial palaces were domed, domes were very common over polygonal garden pavilions. Agios Athanasios is a town and a former municipality in the Thessaloniki regional unit, Greece. Since the 2011 local government reform it is part of the municipality Chalkidona, in 2011 the population was 14,753. The municipal unit Agios Athanasios has an area of 155.34 km2, Agios Athanasios is a small town in the Regional Unit of Thessaloniki. It is situated 20 km west of Thessaloniki, on the old road from Thessaloniki to Athens. According to the population census 2011, the population of Agios Athanasios is 4,932. Agios Athanasios is the biggest refugee town in the Prefecture of Thessaloniki and it is built on the old national road that linked, in the past, Thessaloniki to the Western Macedonia and to the Southern Greece. It is founded by refugees from 25 villages of Eastern Thrace and 7 villages of Asia Minor, the refugees moved in Agios Athanasios from October 1922 till 1924. The fist refugees settled in the manoir Kavakli in October 1922, the first 25 families came from Kermeni in Eastern Thrace. 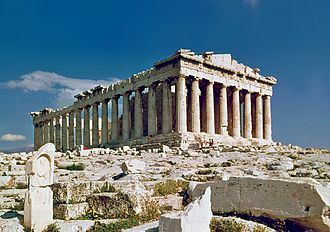 Its nickname is η Συμπρωτεύουσα, literally the co-capital, a reference to its historical status as the Συμβασιλεύουσα or co-reigning city of the Eastern Roman Empire, alongside Constantinople. 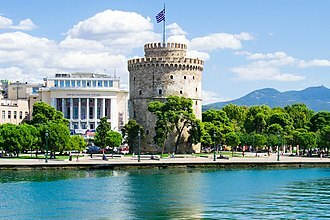 The city is renowned for its festivals and vibrant cultural life in general, Thessaloniki was the 2014 European Youth Capital. 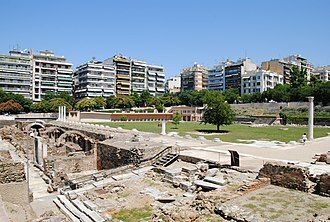 The city of Thessaloniki was founded in 315 BC by Cassander of Macedon, an important metropolis by the Roman period, Thessaloniki was the second largest and wealthiest city of the Byzantine Empire. It was conquered by the Ottomans in 1430, and passed from the Ottoman Empire to modern Greece on November 8,1912, the citys main university, Aristotle University, is the largest in Greece and the Balkans. Thessaloniki is a popular tourist destination in Greece, among street photographers, the center of Thessaloniki is considered the most popular destination for street photography in Greece. All variations of the name derive from the original appellation in Ancient Greek, i. e. Θεσσαλονίκη. 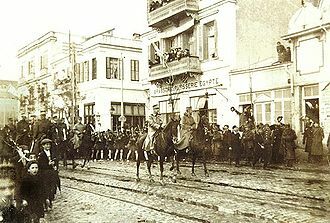 The alternative name Salonica derives from the variant form Σαλονίκη in colloquial Greek speech, in local speech, the citys name is typically pronounced with a dark and deep L characteristic of Macedonian Greek accent. 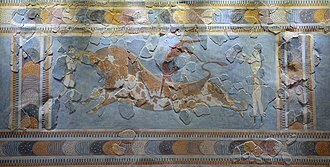 The name often appears in writing in the abbreviated form Θεσ/νίκη, the city was founded around 315 BC by the King Cassander of Macedon, on or near the site of the ancient town of Therma and 26 other local villages. 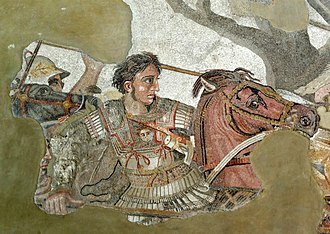 He named it after his wife Thessalonike, a half-sister of Alexander the Great, under the kingdom of Macedon the city retained its own autonomy and parliament and evolved to become the most important city in Macedon. 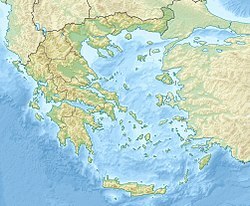 After the fall of the kingdom of Macedon in 168 BC, the city became the capital of one of the four Roman districts of Macedonia. Later it became the capital of all the Greek provinces of the Roman Empire because of the importance in the Balkan peninsula. At the time of the Roman Empire, about 50 A. D. Later, Paul wrote two letters to the new church at Thessaloniki, preserved in the Biblical canon as First and Second Thessalonians. Theotokos is a title of Mary, mother of Jesus, used especially in Eastern Christianity. The usual Latin translations, Dei Genetrix or Deipara, are translated as Mother of God or God-bearer, the Council of Ephesus decreed in 431 that Mary is the Theotokos because her son Jesus is both God and man, one divine person with two natures intimately and hypostatically united. Similar to this is the title of Mother of God, Mother of God is most often used in English, largely due to the lack of a satisfactory equivalent of Greek τόκος / Latin genetrix. The title has been in use since the 3rd century, in the Syriac tradition in the Liturgy of Mari and Addai, Theotokos is an adjectival compound of two the Greek words Θεός God and τόκος childbirth, offspring. A close paraphrase would be whose offspring is God or who gave birth to one who was God, the usual English translation is simply Mother of God, Latin uses Deipara or Dei Genetrix. The Church Slavonic translation is Bogoroditsa, in an abbreviated form, ΜΡ ΘΥ, it often is found on Eastern icons, where it is used to identify Mary. The Russian term is Матерь Божия, variant forms are the compounds Θεομήτωρ and Μητρόθεος, which are found in patristic and liturgical texts. 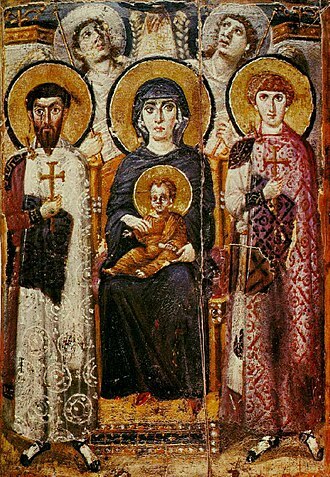 The theological dispute over the term concerned the term Θεός God vs. Χριστός Christ, and not τόκος vs. μήτηρ, to make it explicit, it is sometimes translated Mother of God Incarnate. This decree created the Nestorian Schism, Cyril of Alexandria wrote, I am amazed that there are some who are entirely in doubt as to whether the holy Virgin should be called Theotokos or not. 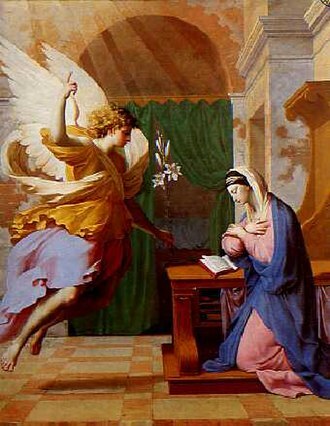 For if our Lord Jesus Christ is God, how is the holy Virgin who gave birth, not. But the argument of Nestorius was that divine and human natures of Christ were distinct, at issue is the interpretation of the Incarnation, and the nature of the hypostatic union of Christs human and divine natures between Christs conception and birth. Within the Orthodox doctrinal teaching on the economy of salvation, Marys identity, for this reason, it is formally defined as official dogma. The only other Mariological teaching so defined is that of her virginity, both of these teachings have a bearing on the identity of Jesus Christ. Byzantine architecture is the architecture of the Byzantine Empire, known as the Later Roman or Eastern Roman Empire. Byzantine architecture was influenced by Roman and Greek architecture and Sassanian. Early Byzantine architecture drew upon earlier elements of Roman architecture, stylistic drift, technological advancement, and political and territorial changes meant that a distinct style gradually resulted in the Greek cross plan in church architecture. Most of the structures are sacred in nature, with secular buildings mostly known only through contemporaneous descriptions. 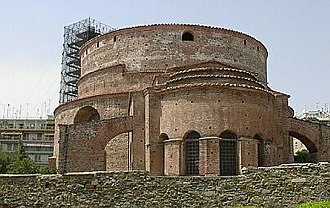 Prime examples of early Byzantine architecture date from Justinian Is reign and survive in Ravenna and Istanbul, secular structures include the ruins of the Great Palace of Constantinople, the innovative walls of Constantinople and Basilica Cistern. A frieze in the Ostrogothic palace in Ravenna depicts an early Byzantine palace, remarkable engineering feats include the 430 m long Sangarius Bridge and the pointed arch of Karamagara Bridge. The period of the Macedonian dynasty, traditionally considered the epitome of Byzantine art, has not left a legacy in architecture. The cross-in-square type became predominant in the Slavic countries which were Christianized by Salonikas missionaries during the Macedonian period, only national forms of architecture can be found in abundance due to this. Those styles can be found in many Transcaucasian countries, such as Russia, Serbia and other Slavic lands, the Paleologan period is well represented in a dozen former churches in Istanbul, notably St Saviour at Chora and St Mary Pammakaristos. Unlike their Slavic counterparts, the Paleologan architects never accented the vertical thrust of structures, as a result, there is little grandeur in the late medieval architecture of Byzantium. Other churches from the years predating the fall of Constantinople survive on Mount Athos. Those of the type we must suppose were nearly always vaulted. The most famous church of this type was that of the Holy Apostles, vaults appear to have been early applied to the basilican type of plan, for instance, at Hagia Irene, the long body of the church is covered by two domes. The Acts of the Apostles, often referred to simply as Acts, is the fifth book of the New Testament, it tells of the founding of the Christian church and the spread of its message to the Roman Empire. Acts and the Gospel of Luke make up a work, Luke–Acts, by the same anonymous author. The first part, the Gospel of Luke, tells how God fulfilled his plan for the salvation through the life and resurrection of Jesus of Nazareth. Acts continues the story of Christianity in the 1st century, beginning with Jesuss Ascension to Heaven, the early chapters, set in Jerusalem, describe the Day of Pentecost and the growth of the church in Jerusalem. Initially the Jews are receptive to the Christian message, but soon turn against the followers of Jesus. Rejected by the Jews, under the guidance of the Apostle Peter the message is taken to the Gentiles. The chapters tell of Pauls conversion, his mission in Asia Minor and the Aegean, and finally his imprisonment in Rome, the title Acts of the Apostles was first used by Irenaeus in the late 2nd century. It is not known whether this was a title or one invented by Irenaeus, it does seem clear, however. The Gospel of Luke and Acts make up a work which scholars call Luke–Acts. The author is not named in either volume. )He admired Paul, the earliest possible date for the composition of Acts is set by the events with which it ends, Pauls imprisonment in Rome c.63 AD, but an early date is now rarely put forward. In either case there is evidence that it was still being revised well into the 2nd century. Luke aligned his work, Luke–Acts, to the narratives which many others had written, the second part, is widely thought of as a history, but it lacks exact analogies in Hellenistic or Jewish literature. The title Acts of the Apostles would seem to identify it with the telling of the deeds and achievements of great men. By and large the sources for Acts can only be guessed at, but Luke would have had access to the Septuagint, the gospel of Mark and the collection of sayings of Jesus called the Q source. Remains of the Basilica of Maxentius and Constantine in Rome. The building's northern aisle is all that remains. The southwest gallery with the wooden Sultan lodge. 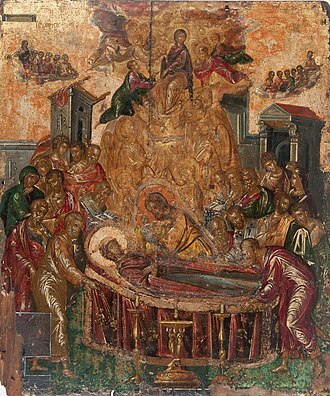 Icon of the Dormition by El Greco, 16th century (Cathedral of the Dormition, Ermoupolis). Icon of the Dormition by Theophan the Greek, 1392. The Theotokos is depicted lying on a bier, surrounded by the Twelve Apostles. At center, Jesus Christ is shown in a mandorla, swaddling the soul of the Virgin Mary (a red seraph is shown above his head). 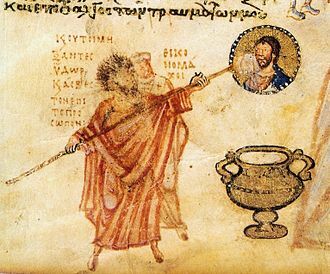 To either side of him are depicted the Hieromartyrs Dionysius the Areopagite and Ignatius the God-Bearer who, according to tradition, are responsible for transmitting the account of the dormition. The Ascension, Dosso Dossi, 16th century. Paul's conversion, from Livre d'Heures d'Étienne Chevalier (c. 1450–1460), Jean Fouquet, in the Château de Chantilly. Jesus and his twelve apostles, fresco with the Chi-Rho symbol <big>☧</big>, Catacombs of Domitilla, Rome. The fire as seen from the Thermaic Gulf. Thessaloniki in the late 1800s. Aristotelous Square as it was built and can be seen today. The fire as seen from the quay in 1917.